The fast and easy way to transfer images, music, and data to your computer! 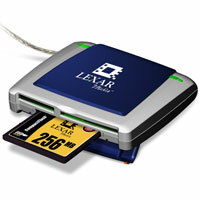 With all of the different types of memory cards available today, the Multi-Card Reader is the most versatile solution for transferring files to your computer. You are able to transfer files from devices such as digital cameras, video camcorders, MP3 players and even personal digital assistants (PDAs). Its compact size and USB connectivity make it convenient to take it with you wherever you go.